In a measuring cup, mix about ¼ cup each of OJ and soy sauce (you can alter the ratio however you want to make it more or less sweet, but you’ll want about ½ cup total), then add enough water to bring the total to just over 2 cups. Bring to a boil in a small pot, adding butter/margarine/oil and a dash of salt if you want, then add the rice, cover, reduce heat, and cook according to the package directions, probably about 20 minutes. Be careful not to over-cook it; it’s best if it’s still a little bit juicy. 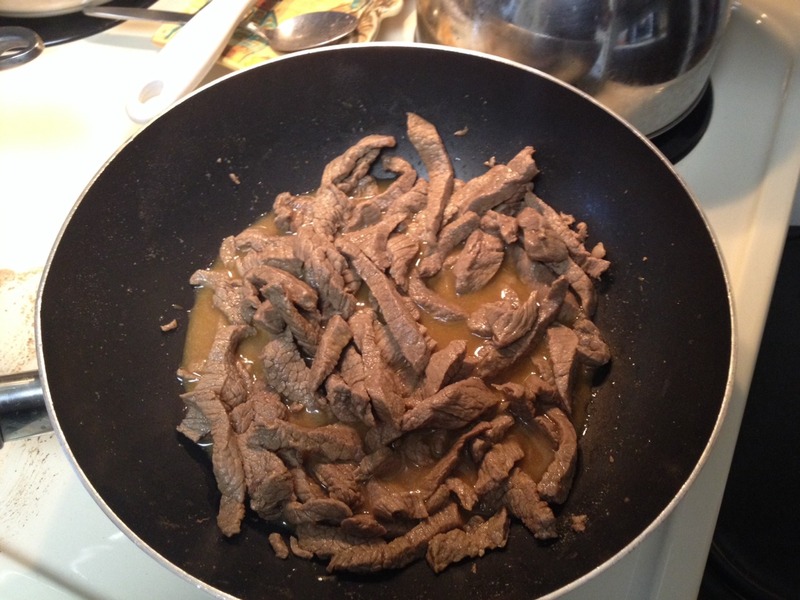 In a wok or large saucepan, cook the beef strips over medium-high heat until all the pieces are just browned. Remove the beef from the pan and drain all of the accumulated juices. Reduce heat to low, pour some OJ and soy sauce into the pan (no need to measure, just cover the bottom of the pan with a decent layer), add the seasonings (I don’t measure those either, just dump some in and taste it as you go) and a drizzle of honey, then add the beef back in and stir to coat. If you want a thicker sauce, you can stir in a little bit of corn starch or flour until you get the consistency you want. You can leave it in the sauce on low heat until the rice is done; that’s why we drained the beef before it was fully cooked through. Be sure to save the sauce to spoon over the rice and so you can dunk the beef in it. It’s so good, you’ll keep piling more on your plate! 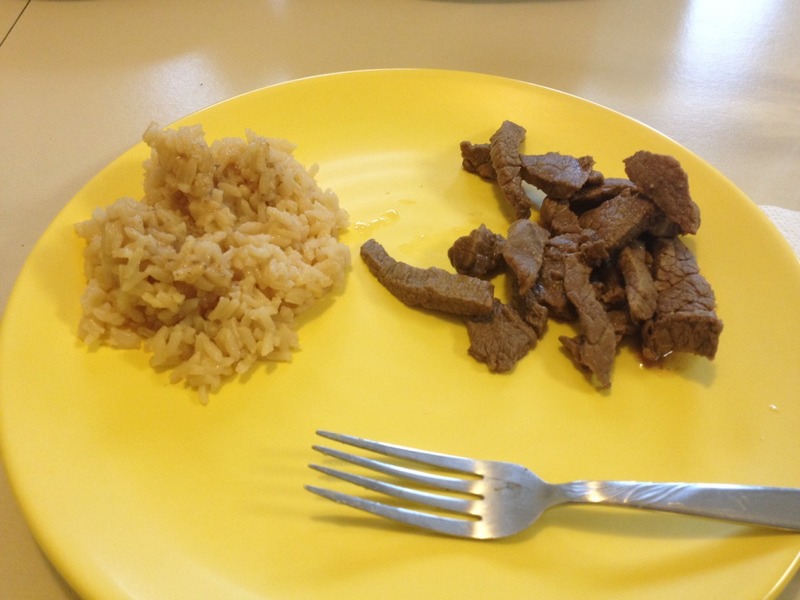 Substitute brown rice or your favorite side dish for the white rice. It’s fantastic with egg noodles — slightly undercook them and then stir them right into the beef mix if your pan is big enough, or remove the beef and add the noodles to the sauce in batches if your pan is too small. You may need to add more sauce or seasonings. You can use fresh-squeezed oranges, but you’ll need a lot of them. I’m lazy, cheap, and always have OJ in the house, so I decided to try that and it’s just easier. But it’s really freaking good with fresh juice. Mix up the seasonings to add your favorites, or use fresh garlic and ginger if you’re in the mood for some mincing. The sauce also works really well with pork; you can slice a pork chop or tenderloin into thin strips. Or try it with chicken, or shrimp. Make it vegetarian or vegan by substituting your favorite non-beef protein and omitting the honey and butter if need be. Use gluten-free soy sauce or replace the butter to make it dairy-free. You can probably make it paleo-friendly but I can’t for the life of me remember those restrictions, so maybe not. You do you. Throw it all in a slow cooker with a beef roast or pork loin to make shredded beef or pork. I just thought of this and will definitely be trying it soon! 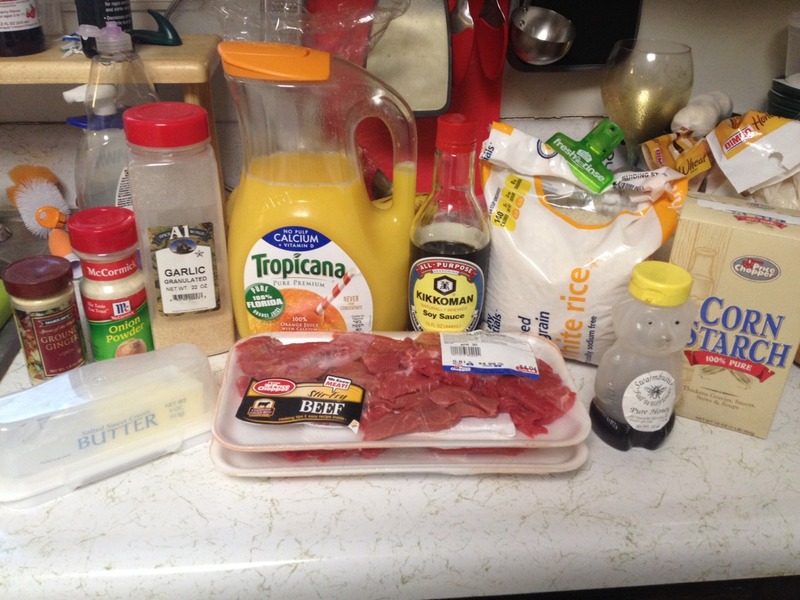 This entry was posted in Food and Drink and tagged beef, easy recipes, orange juice, rice, soy sauce, soy-orange beef, variations on a recipe, who needs exact measurements?. Bookmark the permalink.